Ultimate Sour Cream Chicken Enchiladas are spicy, incredibly yummy, and a great make-ahead dish for a festive dinner party or a casual weeknight meal. A family favorite, this chicken enchiladas recipe is quick, easy to prepare, and a comfort food nirvana. 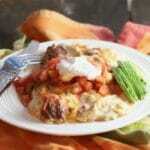 Full of tender chicken, smothered in cheesy goodness, chicken enchiladas with sour cream aren’t just for Cinco de Mayo! Can Sour Cream Chicken Enchiladas be frozen? Absolutely! Sour cream chicken enchiladas are a great make-ahead dish. And, they can easily be frozen for up to three months. For instance, this recipe makes eight enchiladas, so I usually freeze half and then cook the rest. Also, like most pasta dishes, leftover enchiladas are even better the next day. I like to serve Mexican Chopped Salad with Honey Lime Dressing as a side dish with enchiladas. They don’t need anything else except, of course, maybe a margarita. And, don’t forget my homemade Pico de Gallo and guacamole are delicious as toppings. 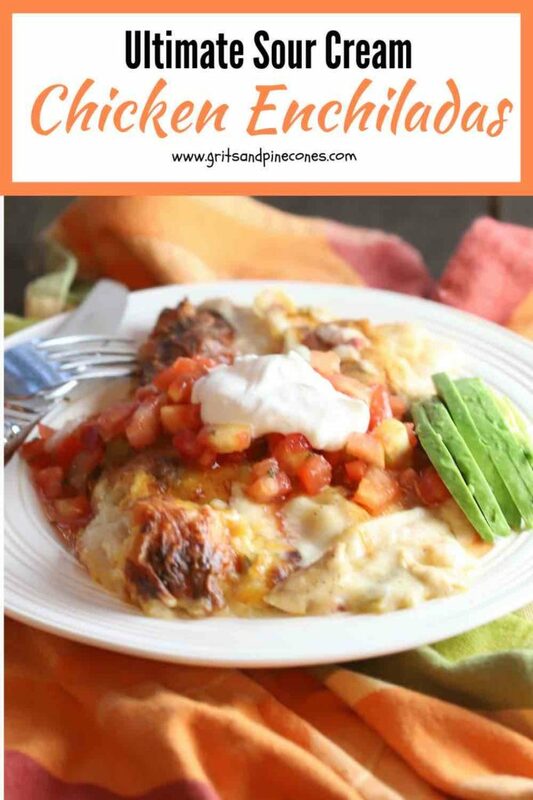 My husband and I both love Mexican food, and I have quite a few enchilada recipes on my blog. The list includes Tequila Lime Chicken Enchiladas, Leftover Turkey Enchiladas, Avocado Lime Chicken Enchiladas, and Salsa Verde Chicken Enchiladas. Check them out! Add olive oil to a large skillet over medium heat. 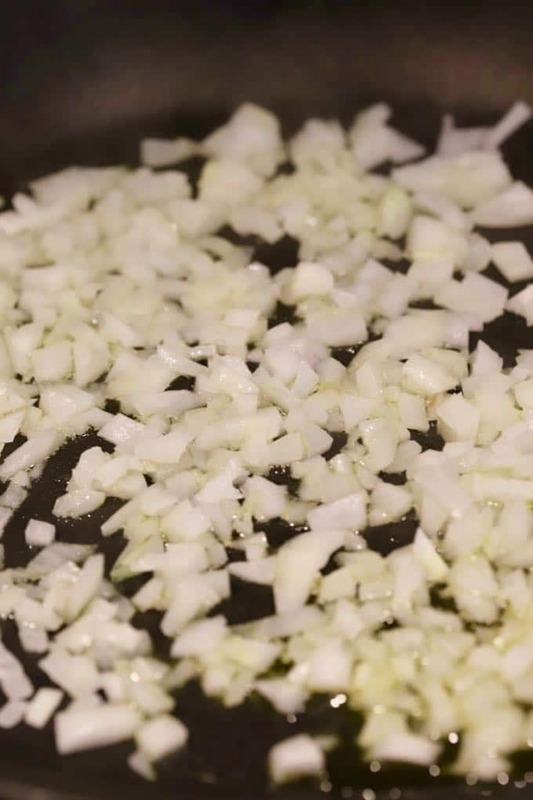 When the oil is hot, add the onion and cook for 5-6 minutes or until the onion is tender and translucent. Add the garlic and cook for about 30 seconds. 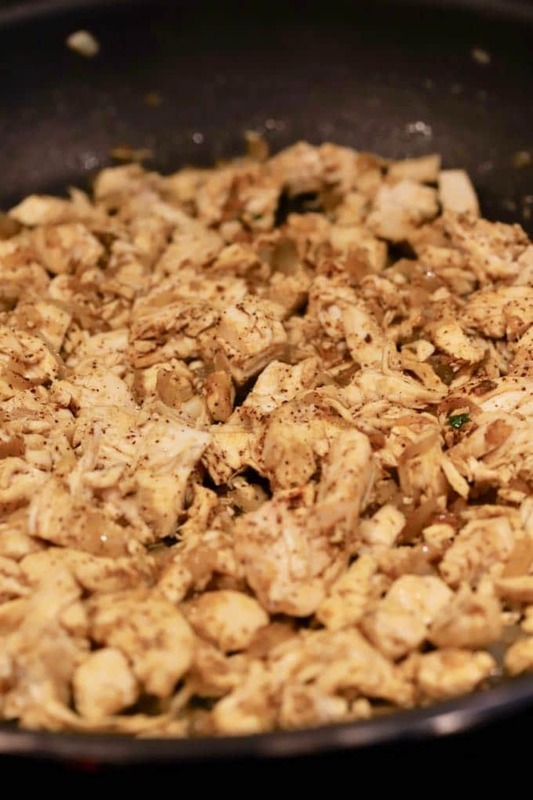 Add the cooked chicken, cumin, and chili powder, stir to combine, and cook for 1-2 minutes or until the chicken is heated. Remove from the heat and allow to cool briefly. Add 1 and 1/2 cups of cheese and stir to combine. 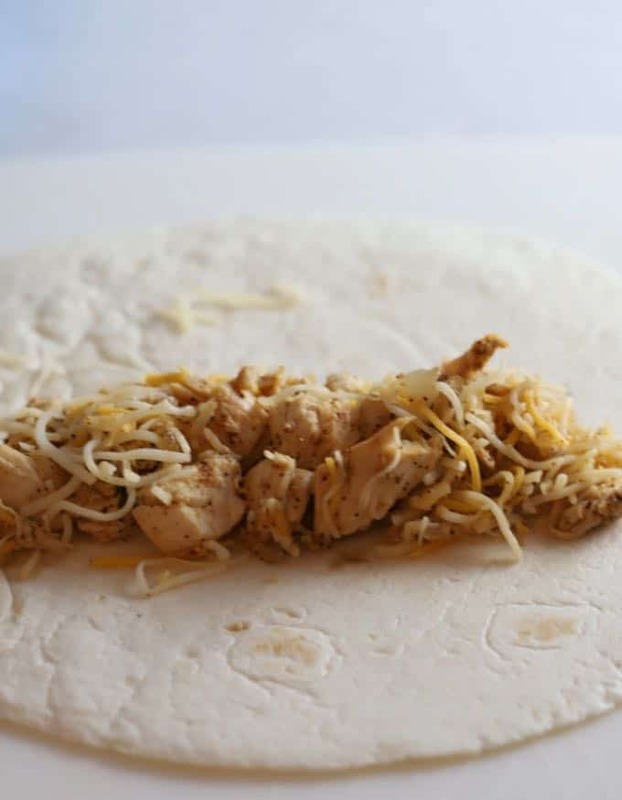 Place about 1/3 cup of the chicken mixture on each tortilla and roll up tightly. Spray a 9×13 baking dish with non-stick cooking spray and add the enchiladas seam side down. Set aside. Melt the butter in a medium skillet or saucepan over medium heat. Add the flour, salt, and pepper, and whisk to combine. Stir and cook for 1-2 minutes or until the mixture is bubbly. Slowly pour in the chicken stock and whisk constantly. Bring to a boil and cook for 3-4 minutes more until the mixture has thickened. Remove the flour mixture from the heat and add the sour cream, and diced tomatoes and green chilies. Mix well. Pour the sour cream sauce evenly over the enchiladas and sprinkle the remaining cheese over the top. Bake for 20-25 minutes until the cheese is melted and the sauce is bubbly. 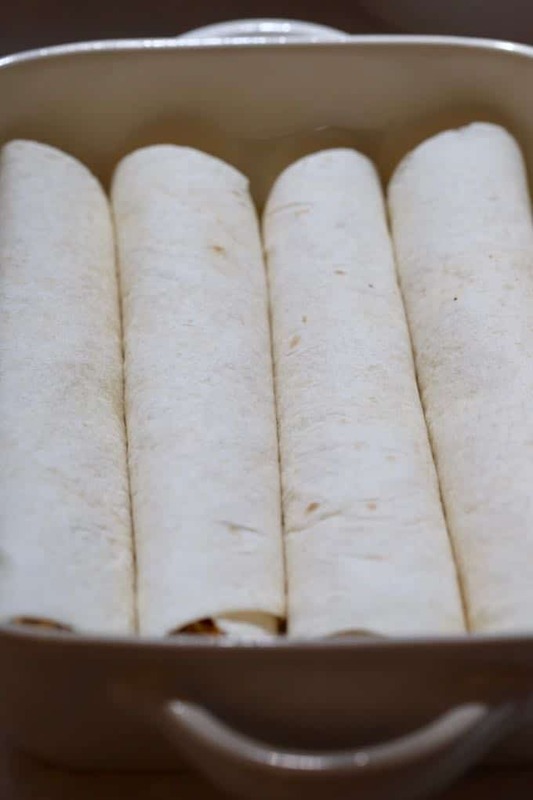 To make ahead, cover the unbaked enchiladas and store in the refrigerator for up to 24 hours or wrap tightly with foil and place in the freezer for up to 3 months. If refrigerated, take the casserole out approximately one hour before baking to come to room temperature. If frozen, allow it to thaw overnight in the refrigerator before baking. Check out my post, How to make Homemade Chicken Stock, if you would like to make your own chicken stock. You can save time, and simplify your meal prep by cooking several chicken breasts or whole chickens in advance. For instance, after cooking, I divide up the meat and freeze it until I need it. I usually put two cups of cut up chicken in plastic freezer storage bags because that’s what most recipes use. However, you can also use a deli roasted rotisserie chicken from your grocery store. Leftover Sour Cream Chicken Enchiladas are also delicious if you reheat them in the oven or microwave. These chicken enchiladas are slightly spicy. If you don’t like heat, simply reduce or leave out the chili powder and use “mild” diced tomatoes and green chilies. Ultimate Sour Cream Chicken Enchiladas are spicy, comforting and a great make-ahead dish for a festive dinner party or a casual weeknight meal. Add the chicken, cumin, and chili powder, stir to combine, and cook for 1-2 minutes or until the chicken is heated. Remove from the heat and allow to cool briefly. Add 1/1/2 cups of cheese and stir to combine. Place about 1/3 cup of the chicken mixture on each tortilla and roll up tightly. Spray a 9x13 baking dish with non-stick cooking spray and add the enchiladas seam side down. Set aside. Remove the flour mixture from the heat and add the sour cream and diced tomatoes and green chilies. Mix well. Pour the sour cream sauce evenly over the enchiladas and sprinkle the remaining choose over the top. Optional: top with salsa, pico de gallo, or avocado, guacamole or extra cheese. To make-ahead, before baking cover the baking dish and store in the refrigerator for up to 24 hours. Or, wrap tightly with foil and place in the freezer for up to 3 months. If refrigerated, place it on your counter approximately one hour before baking to come to room temperature. 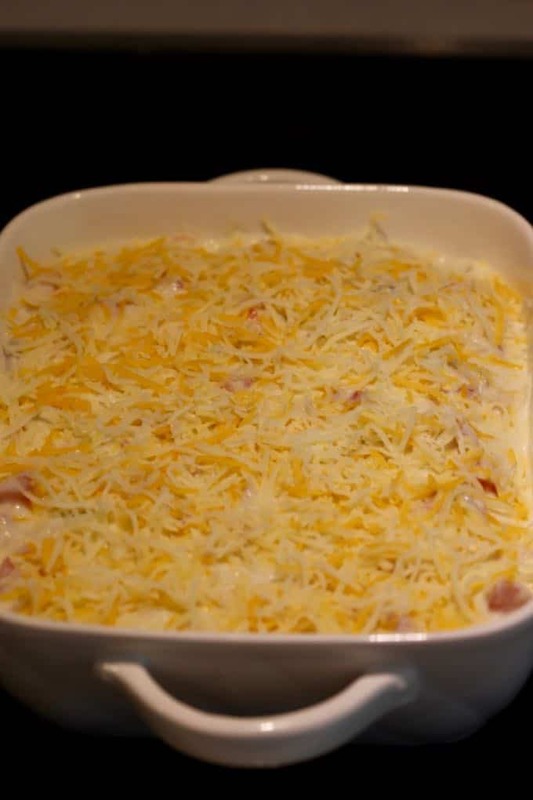 If frozen, allow the casserole to thaw overnight in the refrigerator and let it come to room temperature before baking. Check out my post, How to make Homemade Chicken Stock, if you would like to make chicken stock. You can save time, and simplify your meal prep by roasting several chicken breasts or whole chickens in advance. For instance, after cooking, I divide up the meat and freeze it until I need it. Add two cups of cut up chicken to each plastic freezer storage bag. However, you can also use a deli roasted rotisserie chicken from your grocery store. 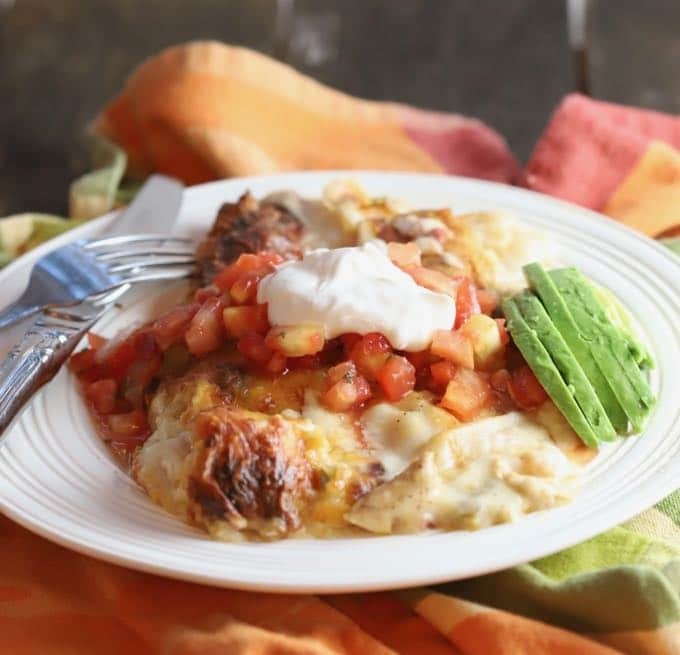 Leftover enchiladas are also delicious reheated in the oven or microwave. These chicken enchiladas are slightly spicy. If you don’t like heat, reduce or leave out the chili powder and use "mild" diced tomatoes and green chilies. Sharon, I am so hungry after reading through your post. 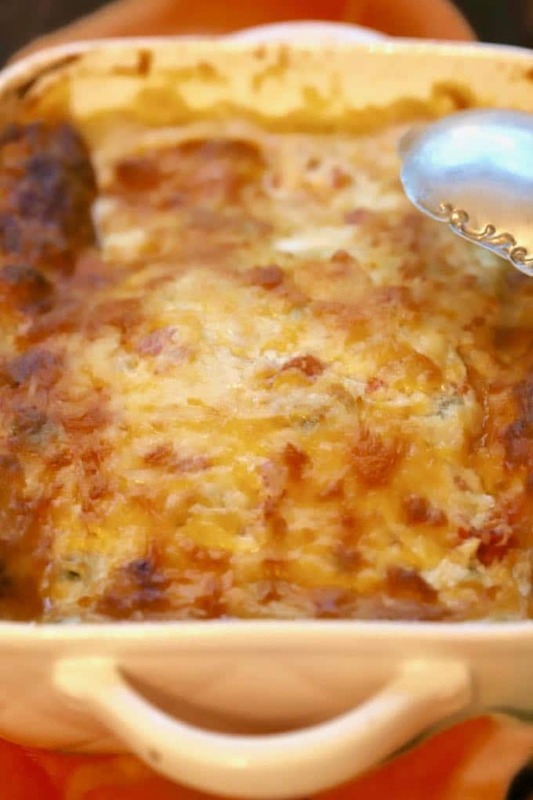 There’s nothing better than cheese-smothered enchiladas. 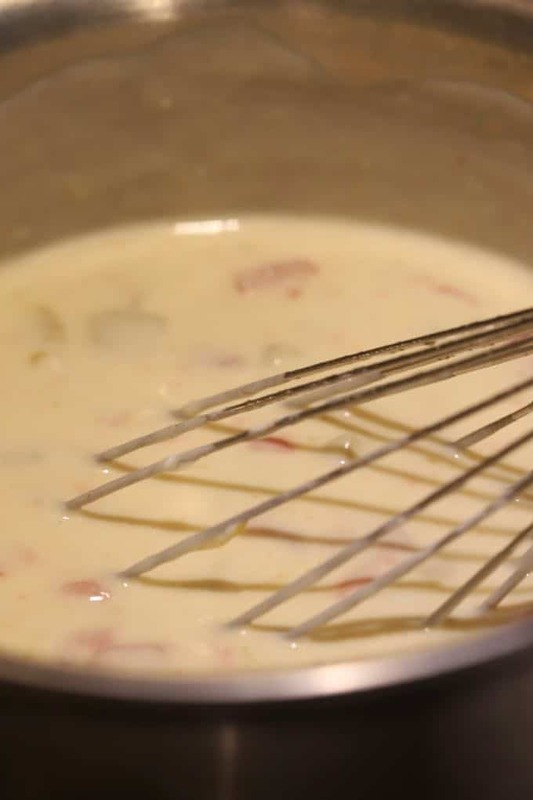 Your green chili sour cream sauce sounds fabulous. This is the ultimate comfort food for wintery evenings. Thanks for sharing. Since tortillas aren’t listed as an ingredient, I’d love to know how many and what size you used. Looks great. Oh, Susan, I can’t believe I forgot to list such a crucial ingredient! I just added the tortillas to the recipe. I used flour tortillas and they were 8 inches wide. However, you could also use the 10-inch ones too! Depending on how much filling you add to each you will end up with 8-10 filled enchiladas. We really enjoyed the enchiladas. We cooked chicken breasts with a little chili powder and cumin using our sous vide cooker. I look forward to making this for company, especially since it can be assembled the day before. Delish!